Hang tabs are available in many styles to fit your retail display needs. 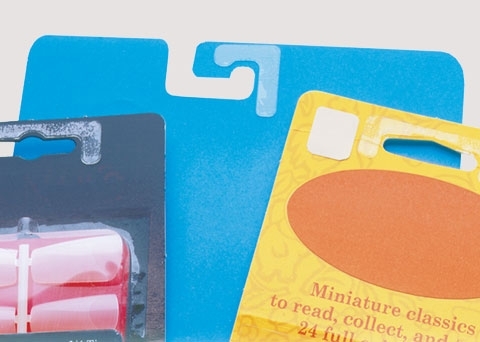 By increasing product visibility, hang tabs raise your brand awareness and create additional merchandising opportunities. We offer hundreds of styles and have millions in stock, ready to go when you need them. Look through our wide assortment of hang tab possibilities for the right hang tab for your product. If you need samples of our products or are unsure of which hang tab to try, please call. Often, people send us the actual product they are looking to hang. This approach is extremely helpful in determining the exact hang tab for your product. Whatever your need, please contact us. We are ready to help. Slot hang tabs are ideal for both single- and double-wire peg hooks. Slot hang tabs allow you to display your product vertically, face-forward, anywhere in the store. 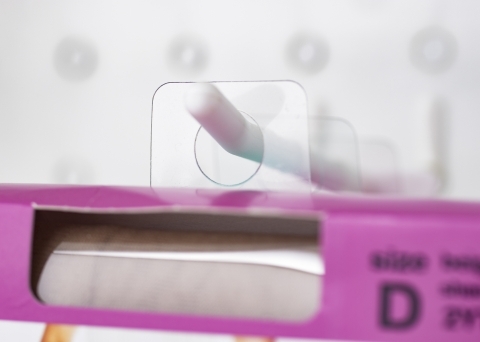 Do-It’s Slot Hang Tabs can reduce packaging materials and cut your costs by allowing you to display more in less space. With both delta- and Euro-shaped holes available, you can be certain that your products will self-center and load easily. Do-It Hook Hang Tabs make selecting exact products quick and simple. For example, hook hang tabs are ideal when displaying more than one size or color of the same product on the same fixture. Customers can easily backshop by removing products from any position on the retail display peg. 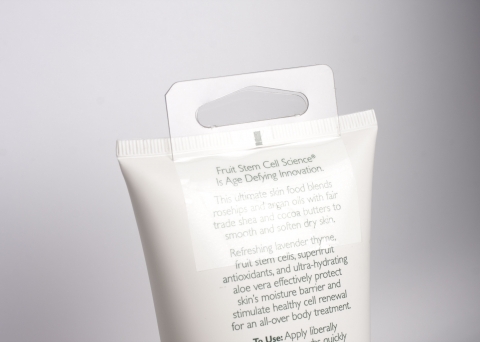 Furthermore, clear hang tabs don’t obscure product messages and contribute to a clean appearance. Do-It Round Hole Hang Tabs are strong, easy to apply and affordable. Ideal for hanging smaller, lightweight items on single-wire pegs, round hole hang tabs are a tried-and-true way to boost product visibility, brand awareness, and impulse purchases. Do-It Fold-Up Hang Tabs lie flat for shipping and fold up for hanging in the store - all without increasing master carton or product packaging. Fold-up hang tabs are available in hook, hole and slot hole formats. Do-It Interior Hang Tabs let you hang your box product to make it more visible to customers while providing a clean look and strong holding power. 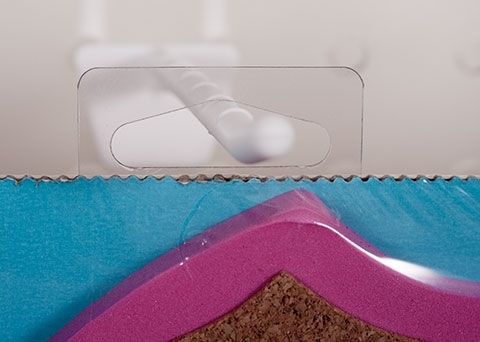 Our security hang tabs seal and secure your package - while hanging your product. And our box top hang tabs adhere directly to the top of a box, letting it hang straight and neat on a peg hook. 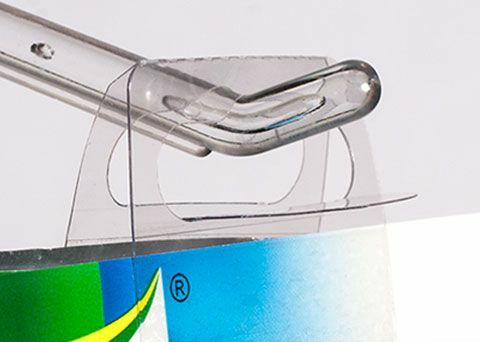 Do-It Reinforcer Hang Tabs eliminate torn header cards and improve existing packaging durability, reducing product returns and lost sales due to damage. They also lower packaging costs by allowing manufacturers to use lighter packaging materials to support heavier products. Reinforcer hang tabs can be applied before or after your blister card or folding carton has been filled. 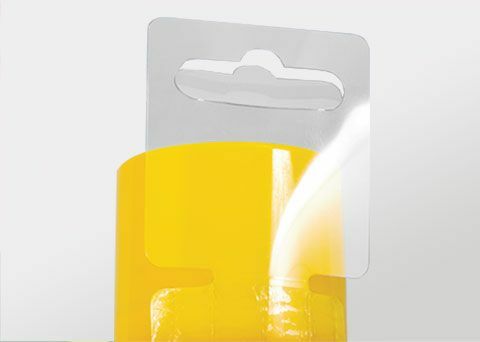 Do-It Heavy Duty Hang Tabs are the strongest, most durable retail packaging option on the market. Ideal for large packages and irregularly shaped products such as lawn mower blades, they are a great way to eliminate bulky clamshell packaging. 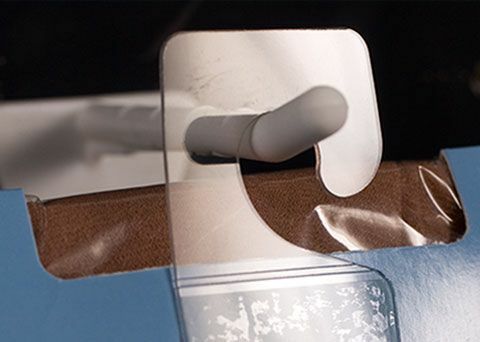 Our heavy duty hang tabs help you save on both packaging and shipping costs by drastically reducing the footprint of your product’s packaging. Certain products require unique hanging solutions. Do-It Cylinder Hang Tabs are a great option for products with curved packaging, allowing these products to hang anywhere in the store. 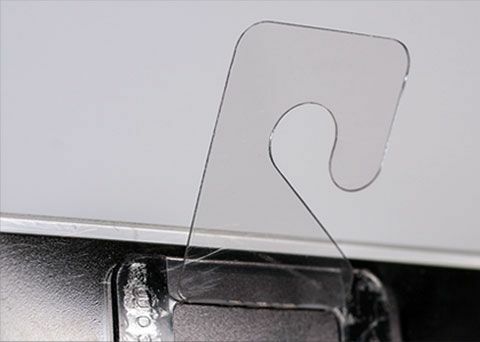 FlexiTab™ Hang Tabs have a thicker hang hole area and thinner adhesive area. 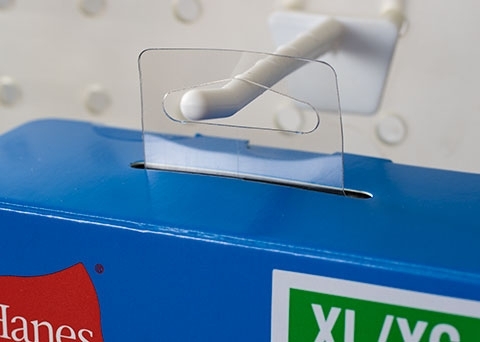 This gives FlexiTabs the ability to stick well to curved, uneven, or uniquely shaped packages. Do-It Ejected Hole Hang Tabs provide a clean, secure method of hanging products anywhere in the store. 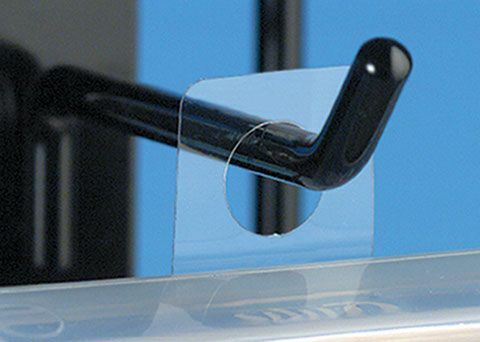 Ejected hole hang tabs are ideal for quickly hanging products on peghooks and Do-It Display Strips.